NOTE: due to operator error, mine, the video has no sound, sorry. Please turn on some background music and watch. Ice fledged sometime this morning. That’s him, in the photo, concentrating on his landing. In the video when Kate the mom shows up with a fish, Ice shows up from the right, flying in for his food. At first I didn’t see Wynd, then I began to notice action in the limbs above Kate and Ice. They showed me where Wynd was; funny watching the two birds trying to figure out just what is over their heads. Turning around on a limb is a difficult exercise and so Wynd, once again, does things the hard way. 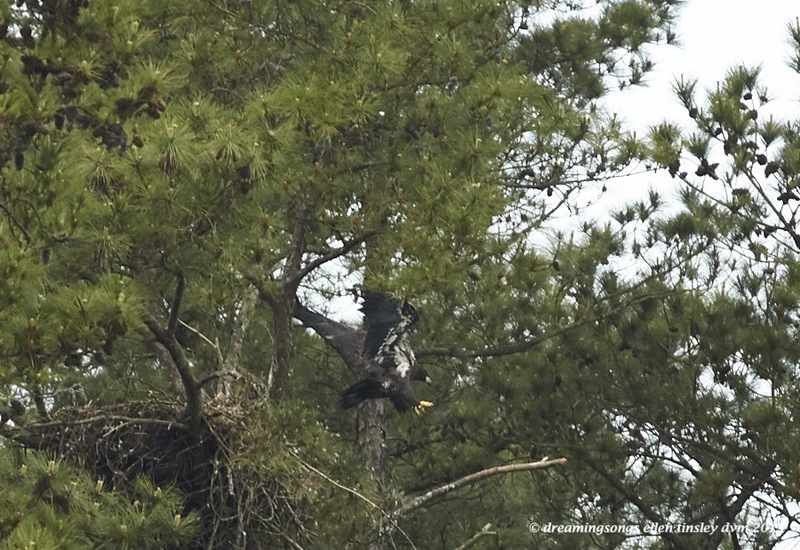 She more or less falls back into the nest and promptly moves Ice out of the way and moves him away from the food. Posted in eagle parents of New Hope, Eagles of Jordan Lake, Jordan Lake, photography, raptors, wild birds and tagged as American bald eagle, bald eagle, bald eagle chick, bald eagle fledgling, bald eagle flight, bald eagles of Jordan Lake, eagle, eagles of Jordan Lake, fledgling, flight, immature bald eagle, immature eagle, Jordan Lake, raptor.